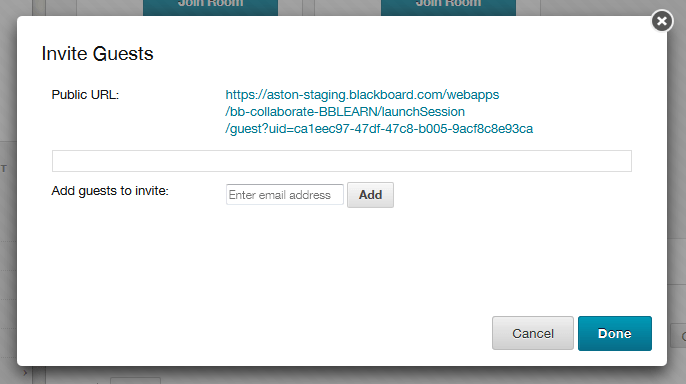 It is possible to allow participants to join a Collaborate session who do not have access to Blackboard. It is best to do this at time of scheduling the session but it can be done retrospectively by editing a previously created session. By switching the Allow Guests option ON when scheduling a session, you can generate a link that can then be distributed in any method suitable to your use. Once you have completed the scheduling process a green box will appear at the top of the Scheduler Tool that contains the link. If you require the link at a later date it can be obtained from the context menu for the session you have just scheduled. Select the downward chevron icon at the end of the session title. A box will appear containing the link. You may also send an invite to a guest from this screen by individually entering an invitees’ email address and selecting Add. This will populate the list of invitees who will then be sent an email with a link that will allow them to enter the session.